This affogato rug is hand felted with natural sheep wool, which I processed, and blended with other two qualities of wool in fleece, i.e. Australian merino in brown and blue colors. The natural colored parts of the carpet are the ones which I processed and come from a local sheep breed in Greece. One side consists of more natural white-colored wool and the other side has a larger brown surface. It depends on your personal taste which side you will choose! In the middle as well as at the edges there are natural colored sheep flakes! It measures 100cm (39.4in) x 100cm (39.4in). The final result looks indeed rough and with an uneven surface however it feels smooth and soft and I assure you it will be really warm for the winter since it is made of four thick layers of wool! For more info & photos here! 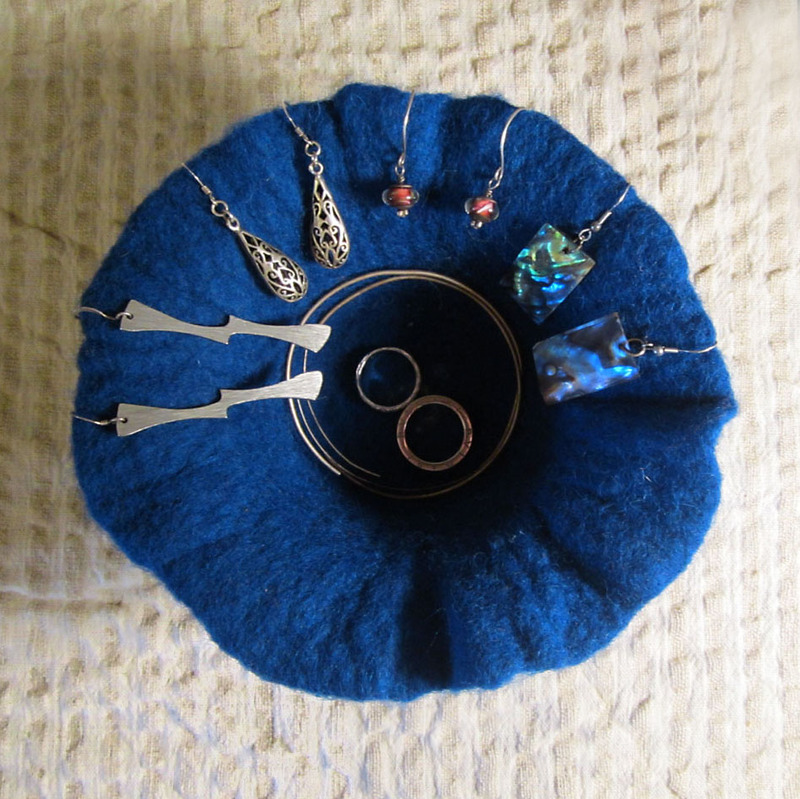 This cute little wool pot is hand-felted with fine merino wool (100%) in blue color. It is made with the wet felting technique and it measures 27 cm (10.6 in) inner circumference, 46 cm (15.7 in) outer circumference and 9 cm (3.5 in) height. 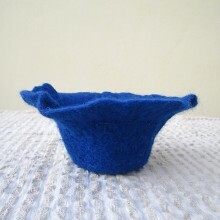 The wool in combination with the wet felting technique creates a soft but however thick fabric providing the bowl a stable shape. You can have it as a decorative table centerpiece holding a candle or a small flower pot. It is ideal for keeping inside your jewelry, mobile and keys, or small odds and ends. On your office desk you can store all small office supplies! If you are an imaginative person I am sure you will find numerous uses for it! 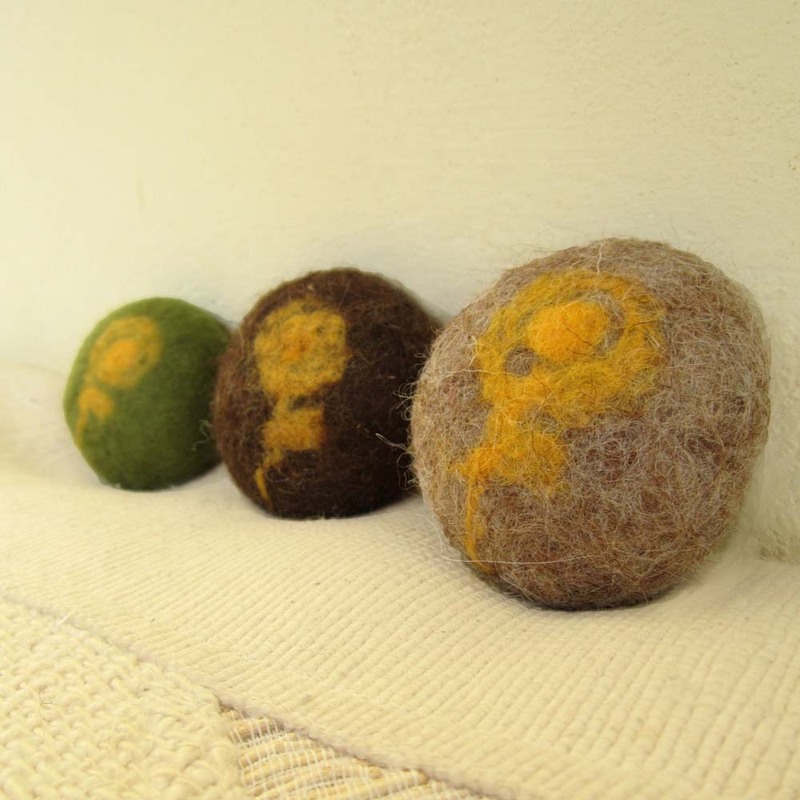 All three of them are hand-felted with fine merino wool in brown, light brown, green, yellow colors, all earthy colors. 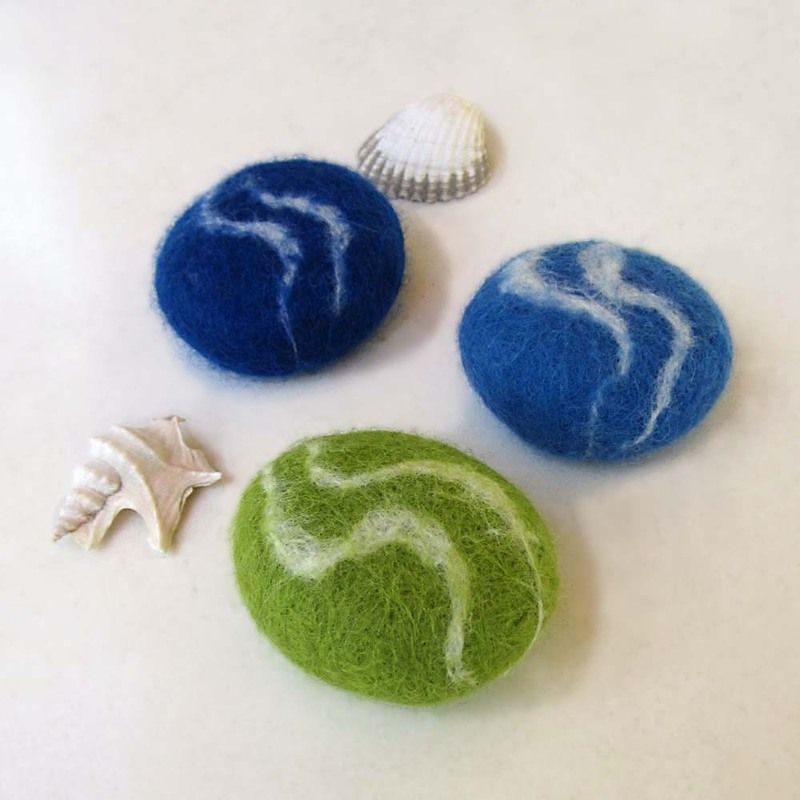 They are firstly needle felted and then delicately wet felted. They measure approximately 6-7 cm in length (2.4-2.8 in). The attributes of wool in combination with the wet felting technique creates a soft but however thick fabric embracing the pebble tight. The pattern represents flowers offering a lively and vivid texture. They are ideal as a decorative table centerpiece or on your desk as presse papier. They fit also perfectly on your balcony or in your yard next to your favorite flowers. They make an excellent home décor adding color and individuality to your lovely nest! It measures 17down-31up cm (6.7down-12.2up in) diameter, 65 cm (25.5 in) circumference and 18 cm (7 in) height. 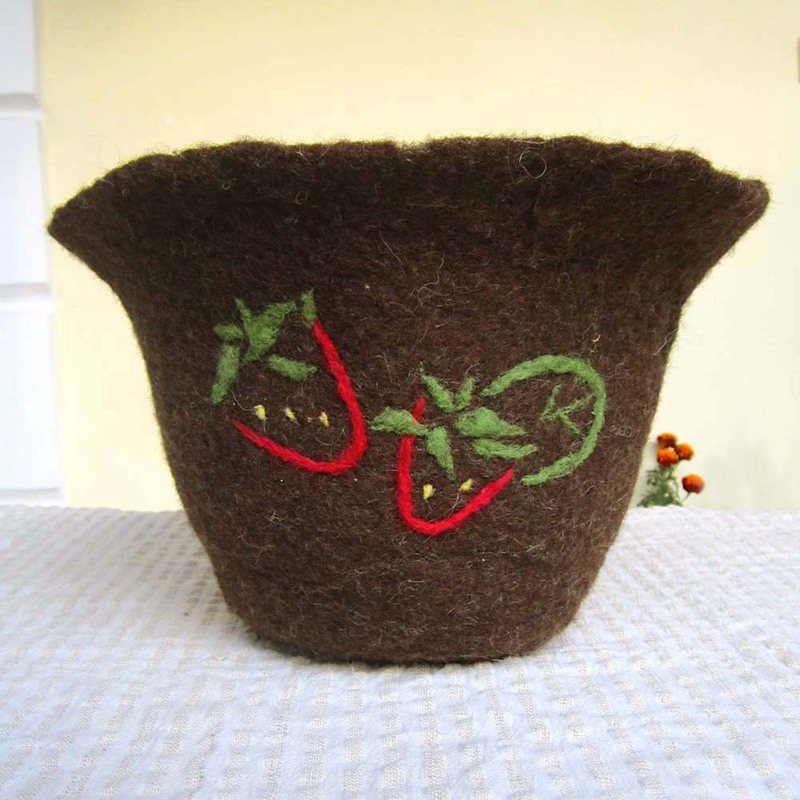 The wool in combination with the wet felting technique creates a soft but however thick fabric providing the bowl a stable shape. You can have it as a decorative table centerpiece a small flower pot or your fruits. It is ideal for keeping inside your cell phone and keys, or small odds and ends. I also use them in the bathroom to place my little beauty items. On your office desk you can store all small office supplies! If you are an imaginative person I am sure you will find numerous uses for it! Mothers don’t hesitate to have it in the play room! It’s kids friendly and unbreakable! 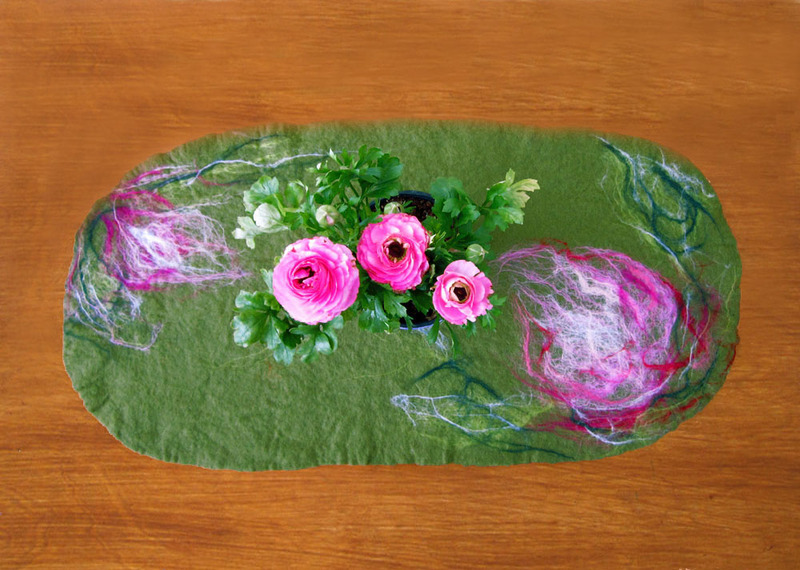 This table runner is hand-felted with fine merino wool (22mic) in olive green, pink, violet, white and apple green colors. 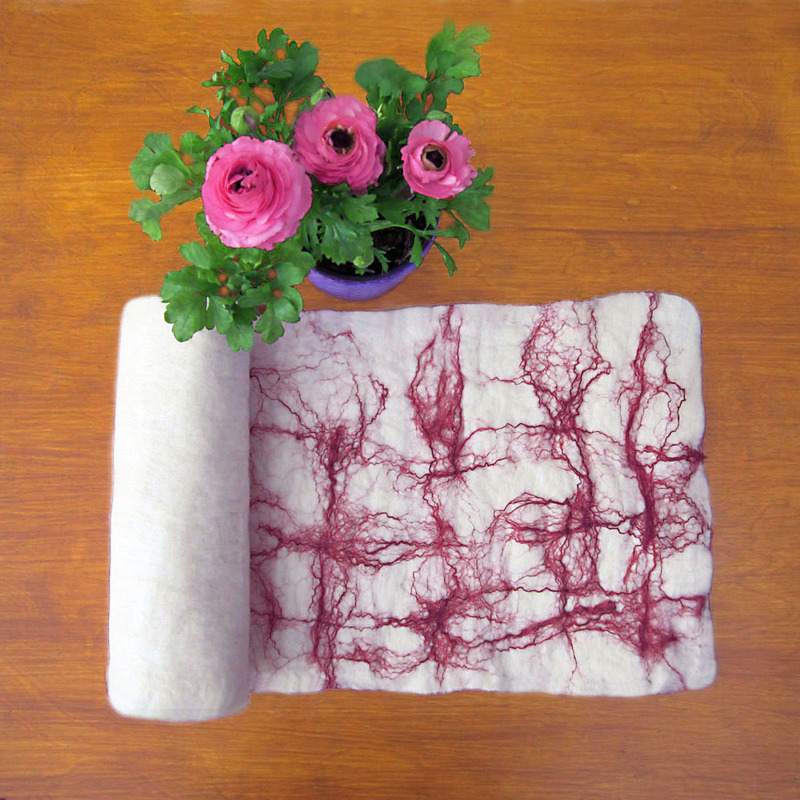 It is made with the wet felting technique and it measures 70 cm (27.5 in) length and 36 cm (14.2 in) width. The wool in combination with the wet felting technique creates a soft but however thick fabric. The pattern represents two spring flowers giving a lively and vivid texture. This table runner is perfect for protecting your tabletop whereas providing a refreshing and modern look to your home decor! 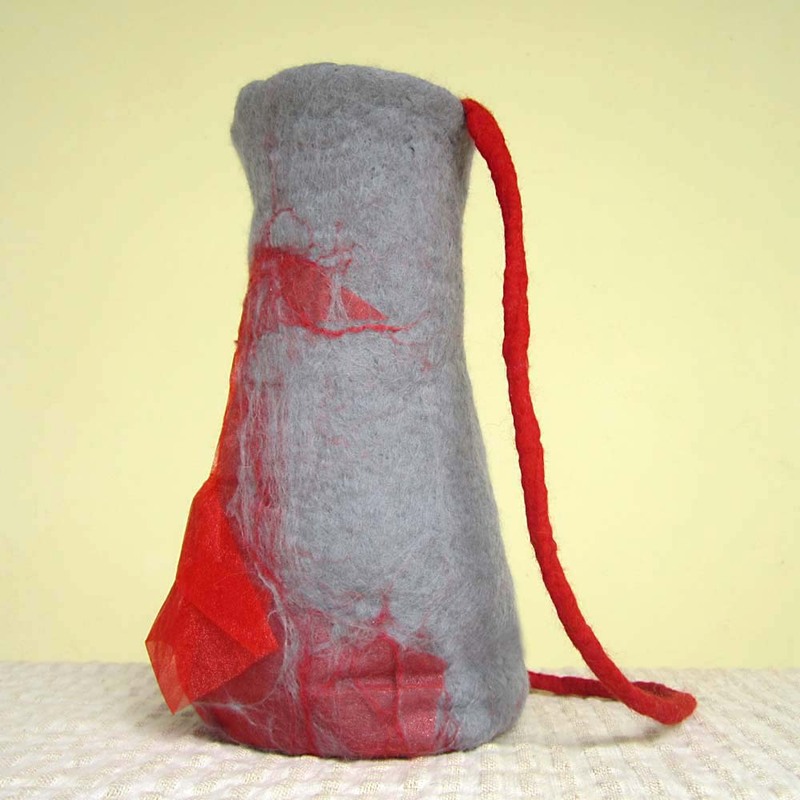 This nuno felted vessel is hand-felted with extra fine merino wool (18 mic) in gray and red colors. Additionally recycled chiffon fabric and mulberry silk threads in red are applied in order to offer a shiny effect and a rich texture. 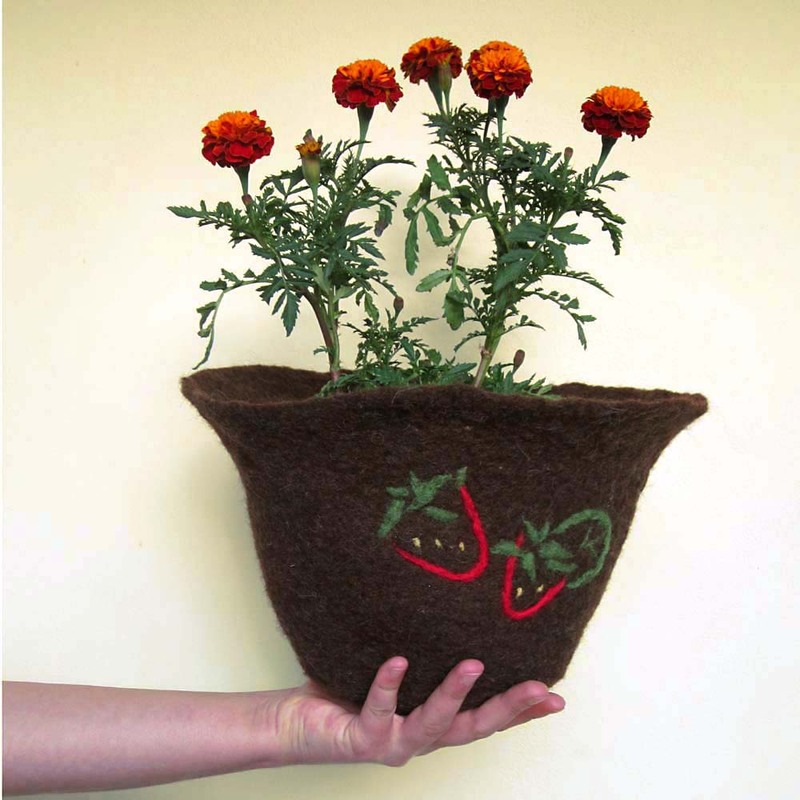 It is made with the wet felting technique and it measures 31-44 cm (12.2-17.3 in) circumference and 25 cm (9.8 in) height. The string measures 63 cm (24.8 in). Although round, its base is flat and can be seated on a table or otherwise can be hung on the wall as a decorative vessel. 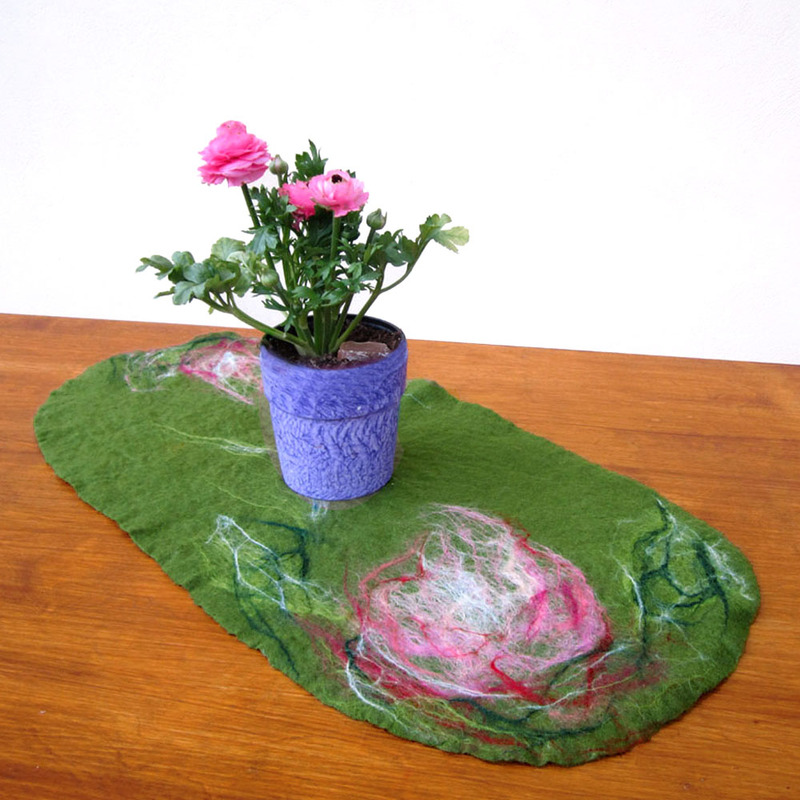 The wool combined with the wet felting technique creates a soft but thick fabric providing the pot a stable shape. It can be used as a vase holding a small bouquet on your dining table or in your kitchen holding the kitchen ladles. 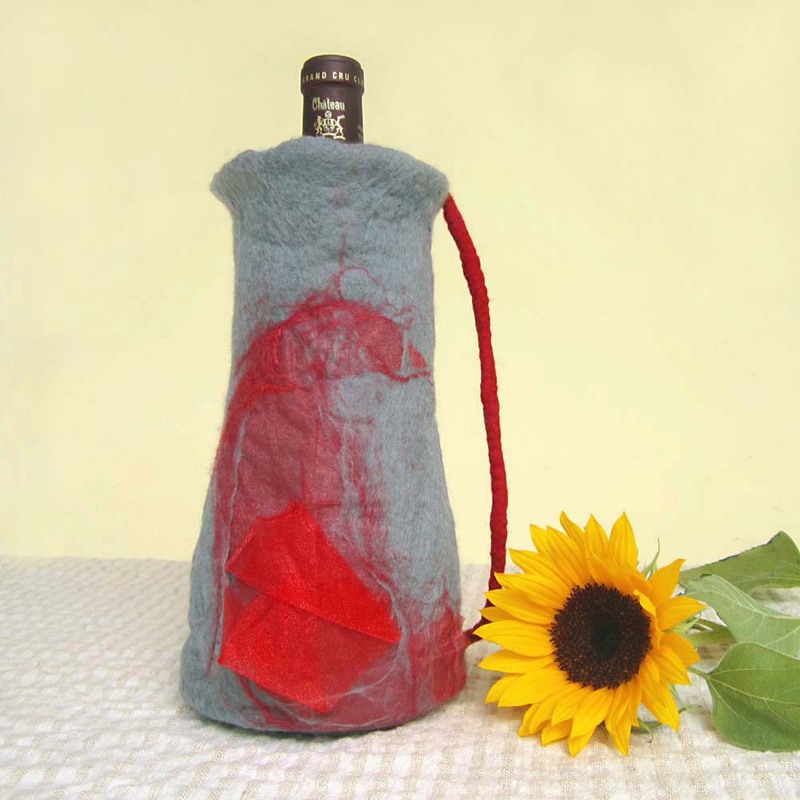 Additionally it can make a perfect wine cooler since wool has insulating properties. If you are an imaginative person I am sure you will find numerous uses for it! 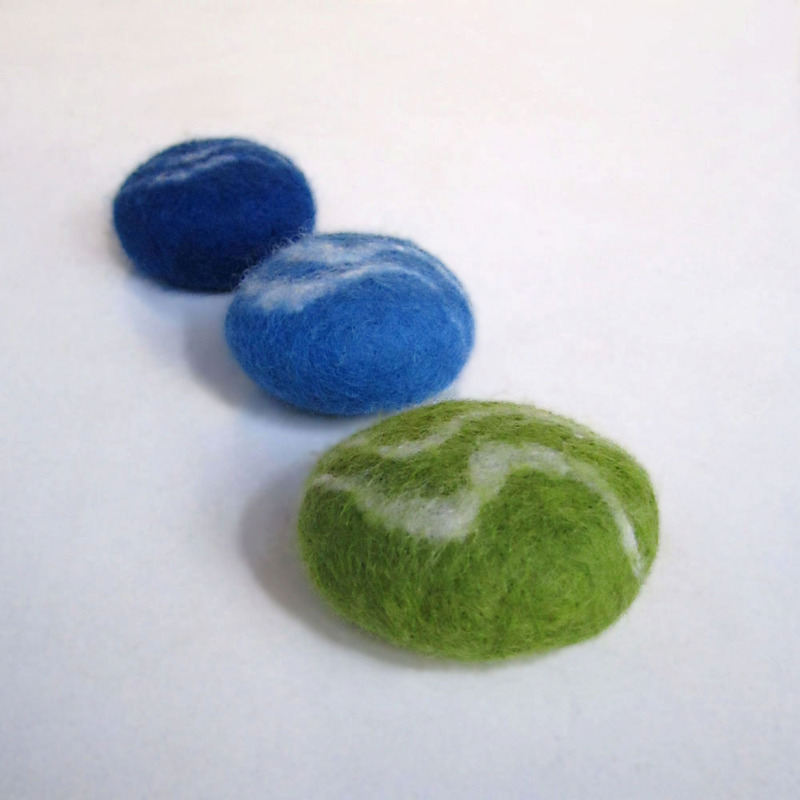 All three of them are hand-felted with fine merino wool in blue, azure, light green and white colors, all sea colors. They are firstly needle felted and then delicately wet felted. They measure approximately 6-7 cm in length (2.4-2.8 in). The attributes of wool in combination with the wet felting technique creates a soft but however thick fabric embracing the pebble tight. The pattern represents the waves offering a lively and vivid texture. 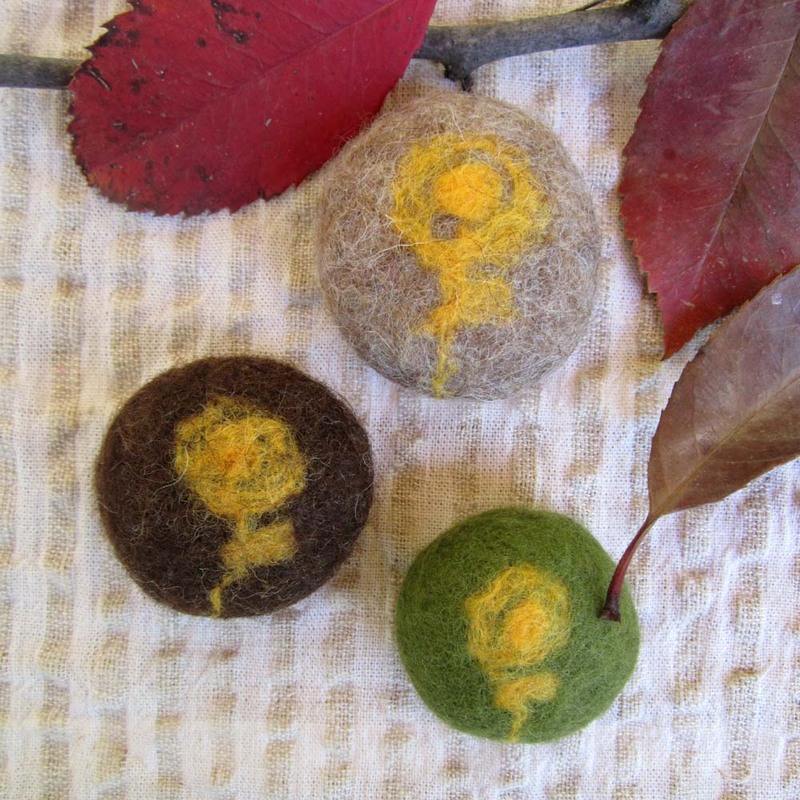 ~ This listing includes all three felted pebbles! ~ You are welcome to order bigger pebbles size and different colors, just contact me! 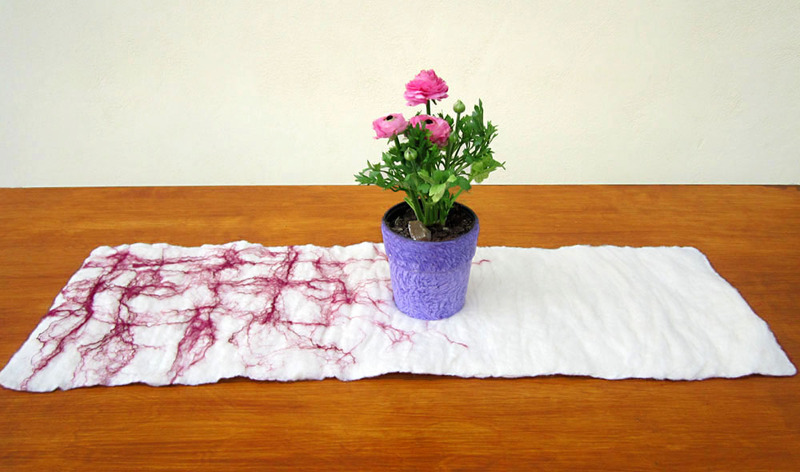 This table runner is hand-felted with extra fine merino wool (18mic) in white and mulberry silk (100%) in deep red. It is made with the wet felting technique and it measures 95 cm (37.4 in) length and 31 cm (12.2 in) width. Its edges are straight though are not trimmed in order to give a natural impression. The quality of wool in combination with the wet felting technique creates a soft but however thick fabric. The mulberry silk pattern blended with the white wool gives a lively and vivid texture. This table runner is perfect for protecting your tabletop whereas providing a refreshing and elegant look to your home decor! You can pay via PayPal by clicking on the button “BUY NOW!”, if you have a PayPal account. Otherwise you can pay with your debit or credit card by clicking on the button “BUY NOW!” (no need for PayPal account) and then choosing “Don’t have a PayPal account” (the instructions will lead you to “Check out”). For more info here!